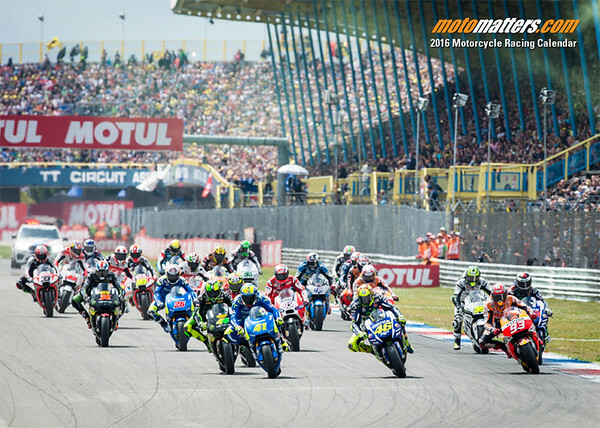 If you have enjoyed MotoMatters.com's coverage of the 2015 season, and are already looking ahead to 2016, then you need the MotoMatters.com 2016 Motorcycle Racing Calendar. As ever, the calendar features the stunning photography of Scott Jones, and a monthly guide containing all of the MotoGP and World Superbike races for the 2016 season, as well as preseason tests for MotoGP, and the schedule for the Isle of Man TT. Only a limited number of calendars will be produced, so fans wanting to get their hands on one will have to be quick. Scott Jones' photos and the handy race schedule is reason enough to own the calendar, but even more importantly, by buying the calendar, you are helping to keep MotoMatters.com running. The proceeds from the calendar go towards the running of the site, and help both Scott Jones and David Emmett travel to the races, take more great photos and provide even more great information. 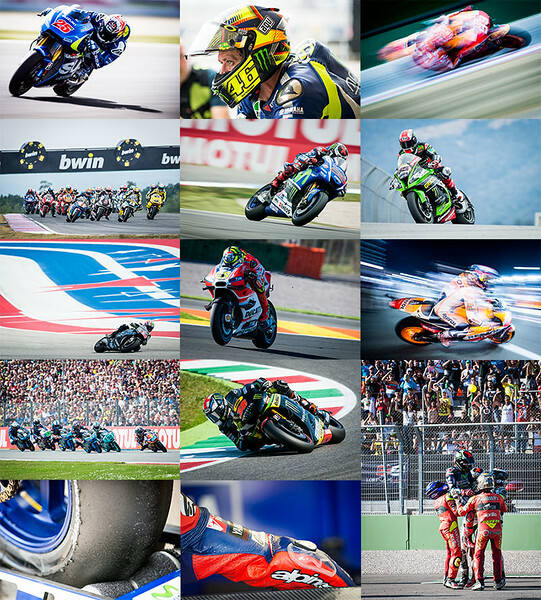 The MotoMatters.com 2016 Motorcycle Racing Calendar has a double-page spread for each month, with one of Scott Jones' fantastic photos above a month grid containing birthdays for most of the leading riders in the MotoGP, World Superbike, Moto2, World Supersport and Moto3 classes, as well as racing legends of the past. To help race fans plan their weekends, every MotoGP and World Superbike round is highlighted on the month grid for easy reference. The simple and clear layout of race weekends makes planning your race trip, viewing party or personal TV / MotoGP.com watching schedule a snap. 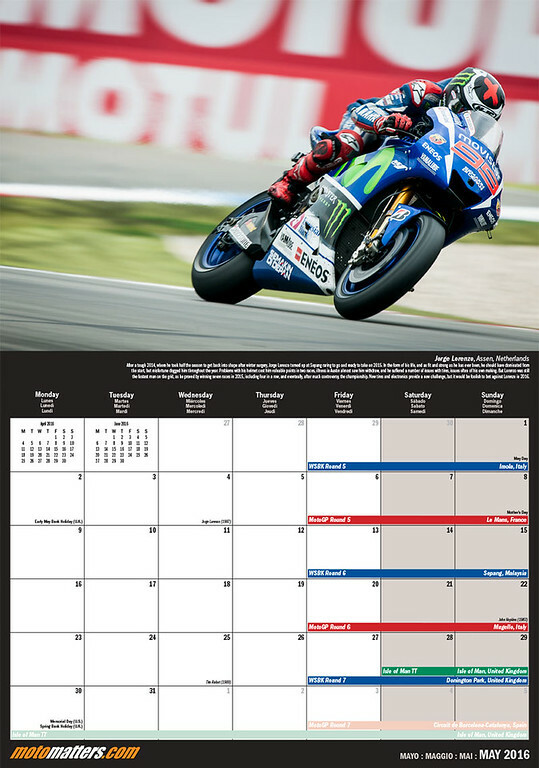 And as is our custom, the center pages feature a double-page close up of the 2015 MotoGP World Champion Jorge Lorenzo. For a full overview of all of the photos in the calendar, see the back page image below. This year's calendar is an attractive 13" x 9.35", or 33cm x 23.8cm, and features a special finish to bring out the best of Scott Jones' pictures. The calendar is only available as a limited edition, with no more to be produced once the calendar sells out. This year's calendar is priced at $29.95 US plus shipping and handling, though MotoMatters.com subscribers receive a generous discount, and can order the calendar for just $21.95 plus shipping and handling. The discount is applied automatically if you order a calendar while logged in as a subscriber. Below you can see a sample double-page layout. US readers should note that the calendar grid has been laid out with the week starting on Monday (European style). This is an explicit choice; the purpose of the calendar is to allow our readers to see the racing at a glance, and as the races are nearly always run on Sunday, it is much easier to see when a race weekend is if the calendar starts on Monday, rather than on Sunday (US style). To make it easier for fans used to a US style week layout, shading has been added to Saturday and Sunday, to make it clear from a distance that the weekend is at the far right-hand side of the grid. The months and days are shown in four languages, English, Spanish, Italian and French. Folded, with a saddle-stitch and punched hole. Finally! I was getting worried already. Now me and my friends have Christmas gifts! Thanks David and Scott. All calendars for Europe are now shipped from Europe, so that shouldn't be a problem. Unfortunately, the way which customs decides to impose import duty on stuff from the US is completely arbitrary, so while most people haven't had to pay import duty, a few have. We have been happy to reimburse them for the extra charge. In the future, all European shipments will be done from Europe, to avoid the situation. Just one final question: Where can I see pictures from the former years? I finally got around to subscribing, ordering the new calendar, and ordering all of the previous calendars too. Merry Christmas to me! I just got mine, a great way to start the year! Beautiful pictures as always with Scott, though they seem a little darker than in last year's calendar?